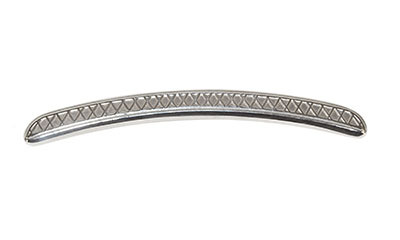 The Small Handlebar is best for treating large muscle groups of petite patients/athletes. Perfect for shoulders, back, neck, side abdominals and hamstrings. Case, emollient, and other accessories sold separately. Dimensions: 16" x 1" x 1"
The Medium Handlebar works best for treating large muscle groups of average-size patients/athletes. Perfect for shoulders, back, neck, side abdominals and hamstrings. Case, emollient, and other accessories sold separately. 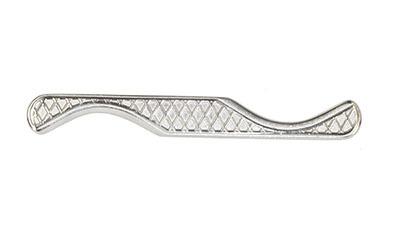 The Large Handlebar is best for treating large muscle groups of bigger patients/athletes. Perfect for shoulders, back, neck, side abdominals and hamstrings. Case, emollient, and other accessories sold separately. Dimensions: 19" x 1" x 1"
The Small Multi-Curve is best for treating small muscle groups and joints. Designed to treat fingers, hands, toes and feet. The Multi-Curve features single bevel, double bevel and convex treatment edges to allow you to treat more precise areas. Case, emollient, and other accessories sold separately. Dimensions: 6" x 0.5" x 0.5"
The Medium Multi-Curve is designed with treatment of a wide variety of muscle groups and joints in mind. Perfect for treating wrists, elbows, calf areas and knees. 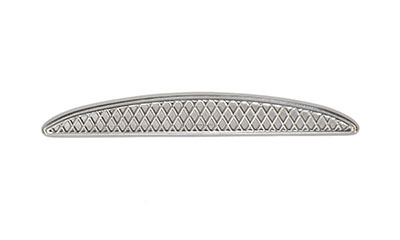 The Medium Multi-Curve features both single bevel and double bevel treatment edges. Case, emollient, and other accessories sold separately. 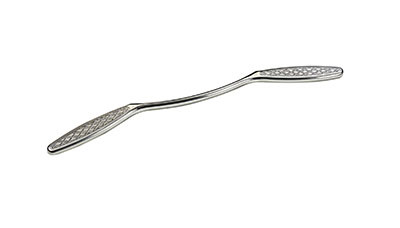 Dimensions: 8" x 0.5" x 0.5"
The Large Multi-Curve is great for treating a variety of muscles groups and joints, particularly of larger patients/athletes. Perfect for treating elbows, calf areas, knees, ankles and feet of larger patients/athletes. 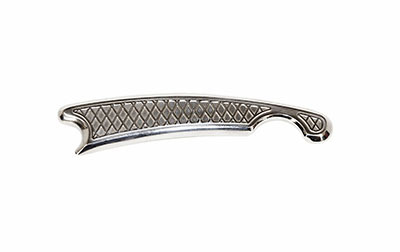 The Large Multi-Curve features both single bevel and double bevel treatment edges. Case, emollient, and other accessories sold separately. 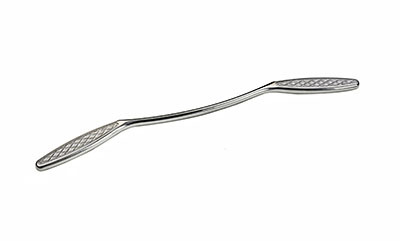 Dimensions: 10" x 0.5" x 0.5"
A highly versatile instrument, the Boomerang is best for diagnosis and more aggressive treatment. Perfect for treating various muscle and joint groups including suboccipital muscles. Features concave treatment edge. Case, emollient, and other accessories sold separately. Best for scanning and treatment, the Scanner is a versatile instrument capable of treating broader surface areas. 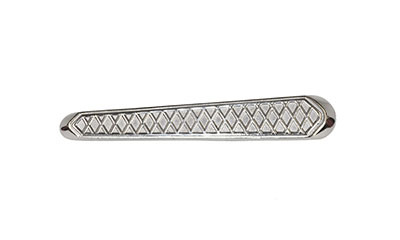 Features convex treatment edge. Case, emollient, and other accessories sold separately. 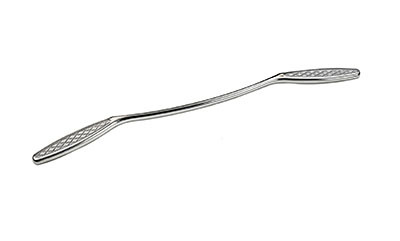 Dimensions: 9" x 0.5" x 0.5"
The Tongue Depressor is best for pinpointing specific treatment areas. 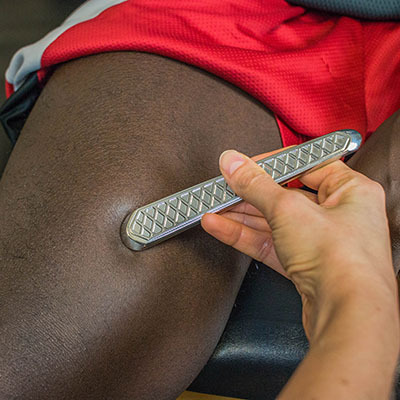 Two treatment edges allow for precise, aggressive treatment of specific muscle and joint areas. Features convex treatment edges. Case, emollient, and other accessories sold separately. The HGPro is perfect for the clinician on the go or the student who isn't quite ready to invest in a full set of instruments yet. 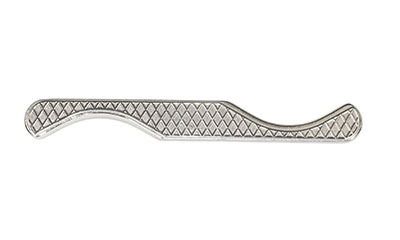 Featuring 7 different treatment edges, both convex and concave, as well as both single and double bevels and our signature crosshatch grip, this instrument can treat a variety of body parts and sizes. The Introductory set includes three small instruments, and is perfect for anyone needing a smaller, more lightweight, or less expensive set of tools. In addition to the tools this set includes a roll-up carrying case, one jar of regular emollient, and a User Manual. The Silver set includes all six of the small HawkGrips instruments, a roll-up carrying case, one jar of regular emolllient, and a User Manual. The most popular HawkGrips set, the Gold set has everything needed for standard practice. Includes the Medium Handlebar, all six small instruments, one jar of regular emollient, and a User Manual. 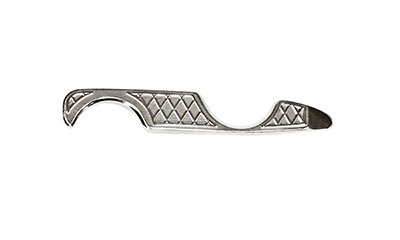 Dimensions: 20" x 4" x 18"
The HawkGrips Platinum set contains nine instruments, providing the most options for the user. Includes Small, Medium, and Large Handlebar instruments, all six small instruments, roll-up carrying case, shoulder bag, one jar of regular emollient, and a User Manual. Dimensions: 26" x 6" x 20"
HawkGrips emollient works to help instruments glide smoothly over the skin while also softening and protecting. Pleasant vanilla fragrance. Single 8oz. jar. HawkGrips emollient works to help instruments glide smoothly over the skin while also softening and protecting. Pleasant vanilla fragrance. Case of five 8oz. jars. HawkGrips emollient works to help instruments glide smoothly over the skin while also softening and protecting. Pleasant vanilla fragrance. Case of ten 8oz. jars. HawkGrips emollient works to help instruments glide smoothly over the skin while also softening and protecting. Pleasant vanilla fragrance. Case of twenty 8oz. jars. HawkGrips emollient works to help instruments glide smoothly over the skin while also softening and protecting. Fragrance free. Single 8oz. jar. HawkGrips emollient works to help instruments glide smoothly over the skin while also softening and protecting. Fragrance free. Case of five 8oz. jars. HawkGrips emollient works to help instruments glide smoothly over the skin while also softening and protecting. Fragrance free. Case of ten 8oz. jars. 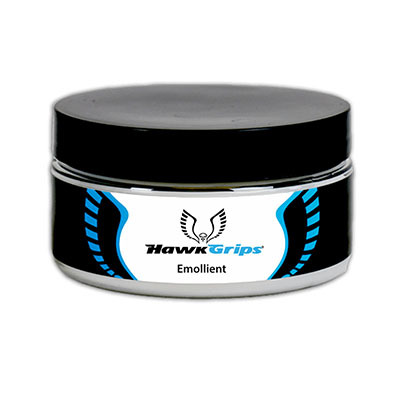 HawkGrips emollient works to help instruments glide smoothly over the skin while also softening and protecting. Fragrance free. Case of twenty 8oz. jars. HawkHydro is a water-based emollient designed specifically for use with IASTM tools. With all of the benefits of the traditional oil-based emollients and none of the mess, HawkHydro is easy to use and wipe away. Packaged in a squeezable bottle to avoid cross-contamination. Single 4 oz. bottle. 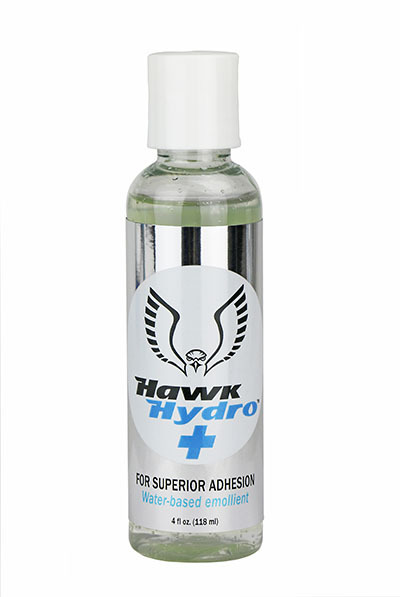 Dimensions: 0.75" x 1.5" x 1.5"
HawkHydro is a water-based emollient designed specifically for use with IASTM tools. With all of the benefits of the traditional oil-based emollients and none of the mess, HawkHydro is easy to use and wipe away. Packaged in a squeezable bottle to avoid cross-contamination. Case of (5) 4 oz. bottles. 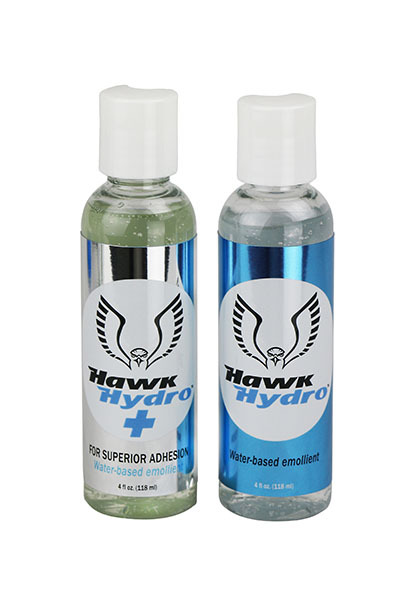 HawkHydro is a water-based emollient designed specifically for use with IASTM tools. With all of the benefits of the traditional oil-based emollients and none of the mess, HawkHydro is easy to use and wipe away. Packaged in a squeezable bottle to avoid cross-contamination. Case of (10) 4 oz. bottles. 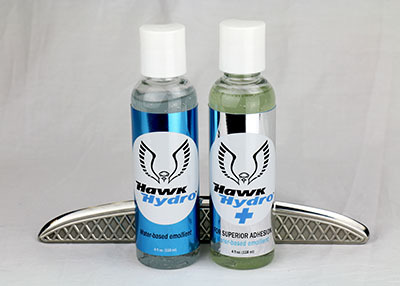 HawkHydro is a water-based emollient designed specifically for use with IASTM tools. With all of the benefits of the traditional oil-based emollients and none of the mess, HawkHydro is easy to use and wipe away. Packaged in a squeezable bottle to avoid cross-contamination. Case of (20) 4 oz. bottles. HawkHydro+ is a water-based emollient designed specifically for use with IASTM tools. With all of the benefits of the traditional oil-based emollients and none of the mess, HawkHydro+ is easy to use and wipe away. After use for IASTM treatment, the polymers in HawkHydro+ dry to a gentle adhesive to prepare skin for kinesiology taping. Packaged in a squeezable bottle to avoid cross-contamination. Single 4 oz. bottle. HawkHydro+ is a water-based emollient designed specifically for use with IASTM tools. With all of the benefits of the traditional oil-based emollients and none of the mess, HawkHydro+ is easy to use and wipe away. After use for IASTM treatment, the polymers in HawkHydro+ dry to a gentle adhesive to prepare skin for kinesiology taping. Packaged in a squeezable bottle to avoid cross-contamination. Case of (5) 4 oz. bottles. HawkHydro+ is a water-based emollient designed specifically for use with IASTM tools. With all of the benefits of the traditional oil-based emollients and none of the mess, HawkHydro+ is easy to use and wipe away. After use for IASTM treatment, the polymers in HawkHydro+ dry to a gentle adhesive to prepare skin for kinesiology taping. Packaged in a squeezable bottle to avoid cross-contamination. Case of (10) 4 oz. bottles. HawkHydro+ is a water-based emollient designed specifically for use with IASTM tools. With all of the benefits of the traditional oil-based emollients and none of the mess, HawkHydro+ is easy to use and wipe away. After use for IASTM treatment, the polymers in HawkHydro+ dry to a gentle adhesive to prepare skin for kinesiology taping. Packaged in a squeezable bottle to avoid cross-contamination. Case of (20) 4 oz. bottles. 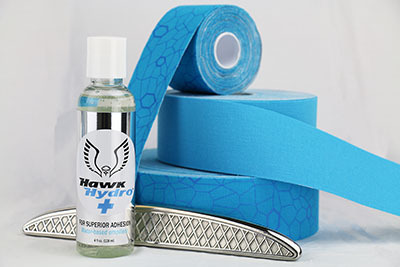 HawkHydro is a water-based emollient designed specifically for use with IASTM tools. With all of the benefits of the traditional oil-based emollients and none of the mess, HawkHydro+ is easy to use and wipe away. After use for IASTM treatment, the polymers in HawkHydro+ dry to a gentle adhesive to prepare skin for kinesiology taping. Packaged in a squeezable bottle to avoid cross-contamination. Case of (2). 1 4 oz. bottle of HawkHydro and 1 4 oz. bottle of HawkHydro+. 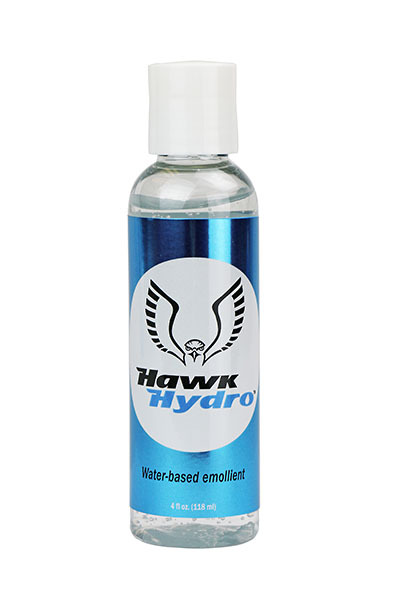 HawkHydro is a water-based emollient designed specifically for use with IASTM tools. With all of the benefits of the traditional oil-based emollients and none of the mess, HawkHydro+ is easy to use and wipe away. After use for IASTM treatment, the polymers in HawkHydro+ dry to a gentle adhesive to prepare skin for kinesiology taping. Packaged in a squeezable bottle to avoid cross-contamination. Case of (10). 5 4 oz. bottles of HawkHydro and 5 4 oz. bottles of HawkHydro+. 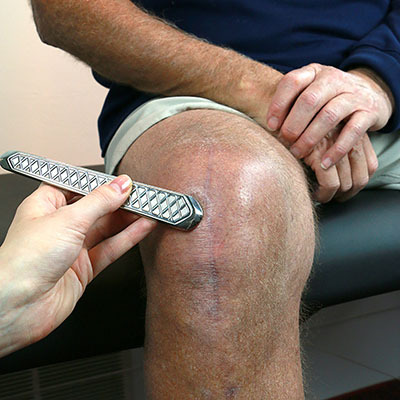 HawkHydro is a water-based emollient designed specifically for use with IASTM tools. With all of the benefits of the traditional oil-based emollients and none of the mess, HawkHydro+ is easy to use and wipe away. After use for IASTM treatment, the polymers in HawkHydro+ dry to a gentle adhesive to prepare skin for kinesiology taping. Packaged in a squeezable bottle to avoid cross-contamination. Case of (20). 10 4 oz. bottles of HawkHydro and 10 4 oz. bottles of HawkHydro+. 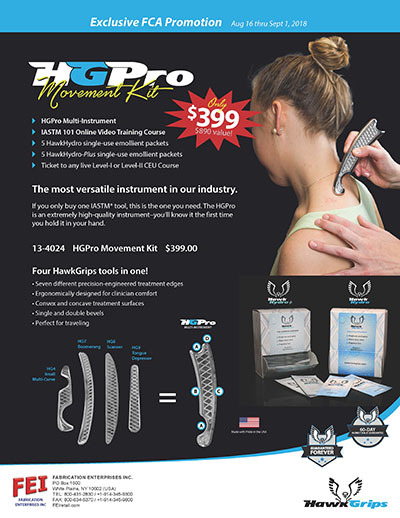 The HGPro Movement kit is perfect for the clinician on the go or the student who isn't quite ready to invest in a full set of instruments yet. 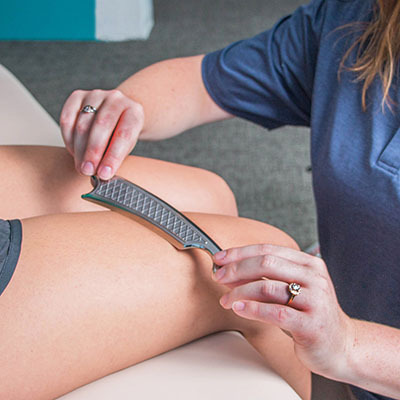 The HGPro features 7 different treatment edges, both convex and concave, as well as both single and double bevels and our signature crosshatch grip, this instrument can treat a variety of body parts and sizes. 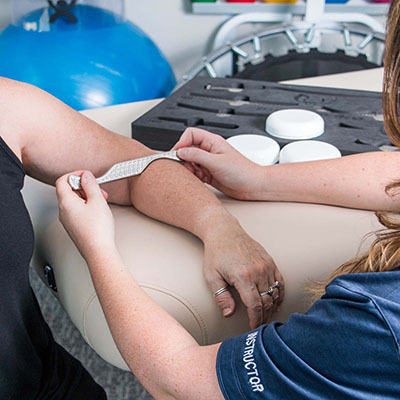 Included with the HGPro Movement Kit is 1 HGPro Multi-Instrument, an IASTM 101 online video training course, 5 HawkHydro emollient packets, 5 HawkHydro-plus emollient packets and a ticket to any live Level 1 or Level 2 CEU course.